My wife has the Jawbone Up2 fitness tracker. It tracks things like steps, hours slept, etc. The mobile app has a Smart Coach feature which gives daily suggestions. Most of the time, the suggestions relate to information that only the tracker knows about, like “try to get more steps today”, or “try to go to bed 20 minutes earlier”. But yesterday, it made a suggestion about things I didn’t think it should have known about. If instead the Smart Coach had told us to “watch less TV”, the generality would have made it less creepy; I would have thought, “lots of people stay up late watching TV, I guess they knew somehow.” But calling out the exact show I was watching makes it clear who disclosed this information. It feels like two of your friends you didn’t think knew each other actually know each other really well—oh, and they’ve been telling each other all of the secrets you told them. Now one of them has let the cat out of the bag by telling you a secret you told the other. What’s more worrisome is coming face-to-face with how one company can use data from another to try and influence behavior. 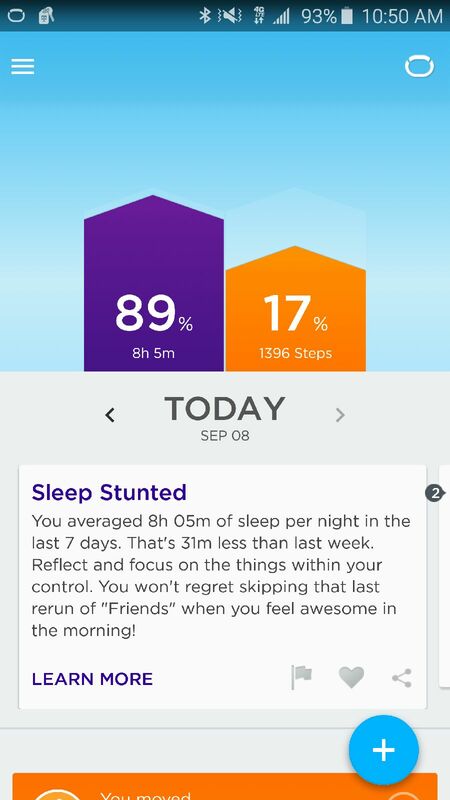 Jawbone deserves credit for trying to influence us into making a decision that’s ultimately good for us and not them (getting more sleep is important, after all). But if this is how two “good” companies are using your data, what are the “bad” companies doing with it? What subtle suggestions are they making?